Skin Parts - Caparo India manufactures all kinds of skin parts such as outer panels and inner panels in various sizes (t = 0.5 - 6.0 mm). It fabricates deep draw and extra deep draw panels and specializes in hemming of doors. High Tensile Parts - High tensile parts are used by OEMs to lend strength and stiffness with a favourable mass to cost ratio. The manufacture of high tensile parts needs special die designing capabilities. Caparo has pioneered this concept in India and supplies 15 such parts to Honda. While each high tensile die capability requires an average of 10 years of experience, Caparo India has built such capabilities within one year at their plant at Greater Noida. 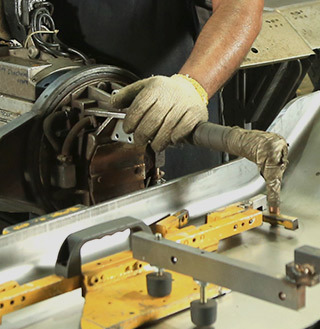 Long Members - They are the members on which the complete chassis and body of commercial vehicles rest, making them a critical component for strength and safety. Caparo India is making long members for Volvo Eicher at its Pithampur plant. The company is the only independent component supplier to import a 4000 ton machine for making a long member automatically. This will increase the speed of production and ensure quality for this critical component. These capabilities were hitherto available only with the OEMs. Assembly Systems - This involves assembling the various body parts including frames, members, floors, etc through a combination of processes like welding and adding nuts and bolts. Body - In - White Systems - Caparo has built capabilities for complete body in white systems that include side panels, body frames, pillars, boot lids, seat components etc. Tailor-welded Blanks - Through its joint venture with Marubeni Itochu of Japan, Caparo has set up a state-of-the-art tailor-welded blanking facility at Bawal with a focus on Technological Innovation. Coil Blanking - Caparo has in-house facilities for coil blanking at Sanand and Bawal. Painted Components - Caparo has the ability to provide painted components (Powder-coated and CED) through its units at Pithampur, Halol, Chennai and Bawal.